I remember a crabby moment a decade or two ago---a bit of an 'a-ha' moment. I was walking through a grocery store, and had this sudden [late to the party] realization that I was staring at the same produce options year-round. I didn't know who to be crabby at. How was it possible I didn't know what produce was 'seasonal'!? For as long as I could remember, there were lemons and limes, apples and bananas. Ever an option: bulbous heads of iceberg lettuce, hoards of carrots and tattered zucchini. Potatoes were abundant, strawberries present and tomatoes (never mind the flavor) piled aisle high. Prices went up and down, but leeks and avocados remained. I was disappointed in my lack of seasonal-food knowledge and it struck me as odd. My grandmother knew, didn't she? So did yours. Where and why was this seasonal eating lost? My grocery store was a year-round supply of both off-season and in-season food all mixed in a happy mess. I was at a loss---and I confess---a bit embarrassed and distraught over my lack of seasonal knowledge. I had read stories of people waiting for the tips of spring's asparagus and summer's juicy tomatoes. Only once a year should watermelon run down your chin and peaches be so ripe they are beyond adjectives. Lambs and goats, piglets were born in the spring---and butchered later that summer or fall. But a strawberry midwinter? It was likely picked early, ripened en route and shipped from another part of the earth. I had heard: seasonal eating is healthier, a natural symposium of nutrients, a 'built-in' balance of vitamins and variety. It was 5 boxes of sticky fresh figs on my doorstep that pushed me off the 'seasonal' cliff. Today I am leaning more deliberately into seasonal eating. Pushing is more like it: forcing my way through crowds of off-season produce, warehouse-ripened food, berries that have traveled to more exotic countries than I ever will. Not too long ago, I pinged a book editor to consider a book called 'Food Parade' where I suggested celebrating in marching order: one seasonal bumper crop after another. 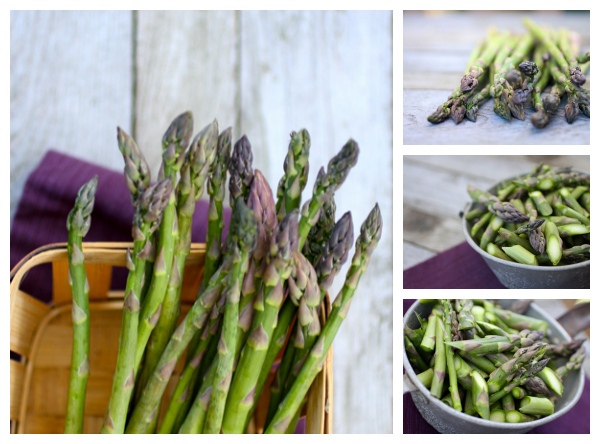 It is spring, so lets talk asparagus. I adore Barbara Kingsolver's Book Animal Vegetable Mineral. She partners spring's asparagus and morels in bread pudding. From my own recipe archives: photos of multi-colored asparagus from an Italian farmer's market, asparagus topped with tomato feta sauce plus poached egg, plus add blanched or steamed asparagus to a seasonal vegetable strudel or 'spring' risotto. 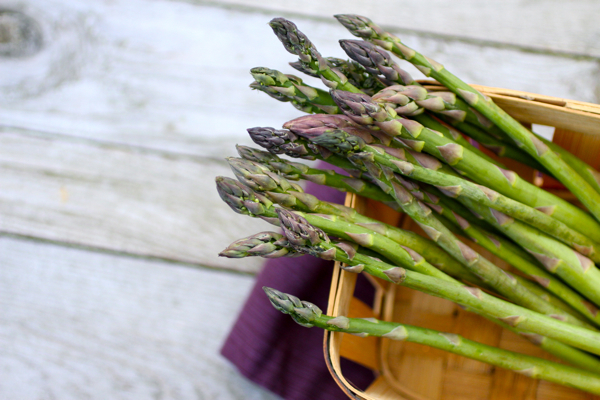 You can stand your asparagus spears up in cool water and they will stay fresh for quite some time. If you hold a spear at both ends and gently bend, it will snap at the point where the tough stalk meets the tender part. If not pickling, the only safe way to can asparagus is using a pressure canner, not a water bath canner. Asparagus, eggs and tarragon are divine together. Goats like asparagus! (she has gorgeous goats, including new baby goats---I wish I could have goats for lovely milk and cheese, but right now cannot milk daily!). Mar 25 Asparagus: snap, crackle, pop!